Emre Erşahin was born in Ankara, Turkey, in 1995. He started music education with piano at the age of seven and studied flute with Stilyana Stavreva when he was at the primary school. 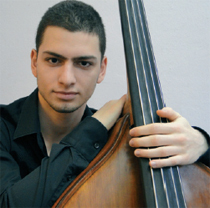 After his education at the Tevfik Fikret Primary School, he entered into Ankara State Conservatory in 2006 and began to study double bass with Alper Müfettişoğlu. 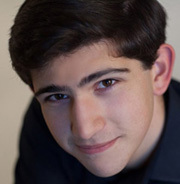 Emre won third prize at the international youth competition in Bass 2008 held in Paris Conservatoire National Superieur de Musique et de Danse in September 2008. He awarded third prize among all the instruments at the “Passion of Music 2010” held by the American Association for Development of the Gifted and Talented (AADGT), in 2010. He won first prize at the international youth double bass competition in Bass 2012 Copenhagen in August 2012 where he also played in the masterclasses of world renowned double bassist such as Duncan McTier, Thomas Martin and Jeff Bredetich. He was a member of the Doğuş Çocuk Symphony Orchestra in Turkey from 2009 to 2011 where he participated to many concert tours until he moved to London. For the last three years he has attended a double bass masterclass in Budapest at the Liszt Academy where he worked with Kubina Peter, Fejervary Zsolt, Stefan Thomas, Radoslav Sasina and Ivan Sztankov and played in the closing concerts. He was awarded a place and a scholarship at the Purcell School and the Yehudi Menuhin School in London. He has been studiying at the Purcell School since September 2011 where he has been studying double bass with Rinat Ibragimov, the principal bassist of London Symphony Orchestra (LSO) and Professor at the Guildhall School of Music and Drama. Whilst at Purcell School Emre has taken part in many concerts as soloist, chamber musician and orchestral player of the Purcell School Symphony Orchestra. He has performed at a number of concert venues in UK including Warwick Art Centre, Wigmore Hall, the Sage Gateshead, Watford Colosseum Royal Festival Hall and the Queen Elizabeth Hall. He also played in the Wigmore Hall, London’s prestigious concert hall, there he gave a solo recital in 23 September 2012. He is one of the three nominee for the Young Musician of the year Award (under 17 age) in Turkey’s 2013 Donizetti Classical Music Awards. Emre became one of the finalist of the Senior Concerto Competition of the Purcell School among all the instruments and he was given a third place by the Jury with his performance of Koussevitsky Double Bass Concerto in 21 March 2013. He has been awarded scholarships and a place both from Royal Academy of Music, Royal Northern College of Music and Guildhall School of Music and Drama for the undergraduate education. He was awarded the prestigious “Associated Board of the Royal Schools of Music Scholarship” and plans to continue his studies at the Royal Academy of Music from September 2013. Emre will play in the Talent Unlimited Ensemble Concert on 25 April 2013 at the St. James’s Church Piccadilly, London. He plans to participate in the following international competitions and a masterclass in coming months.